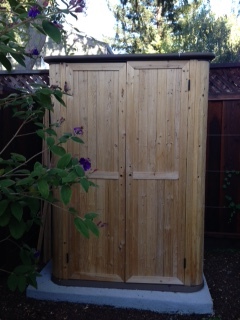 We built a Suncast wooden shed on the patio. Later we poured a concrete slab built for it to set on. We went to special care to ensure the slab was level. When we moved the shed to the slab, we had a great deal of difficulty putting on the (plastic) roof. We now have uneven doors. 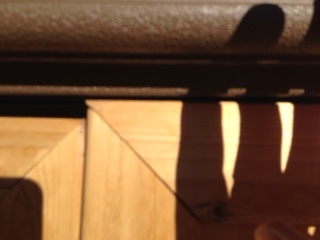 There is an approximate 1/4" gap at the bottom of the right door and the same distance at the top of the left door. This causes the holes for the door hardware not to line up evenly. I've tried putting a shim on one side and then the other, but that does not help. Is there any way to fix this without taking it apart and rebuilding whole thing? Thanks, Gary, for your response! It is pretty much as I suspected. We had a similar problem many years ago when building a playhouse in my dad's yard as a surprise Christmas present for the kids and then moved it to our backyard. I could not remember how we fixed it. I suspected we may have to take the shed apart some, but was hoping not to. I can see that some of the corners are under stress, so it is probably the right thing to do. Sigh. You are right though, it is a nice shed, and door the hardware is very nice, so looking forward to getting it finished. I think your problem may be easy to fix. 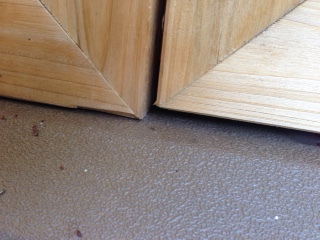 Although the base may be level, the problem is caused because your shed is out of square. If somebody were to stand at the right hand side and push the top of the shed to the left, I expect this would fix it. Alternatively, if you were to put a wedge under the left hand side again this would probably fix it. The problem you may have is that you have put it together out of square and in installing the roof may of fixed it in place out of square. You may not need to dismantle much, but would most likely need to unscrew enough to pull the shed square again. Brace in a square position and then reassemble/re-screw so it is held in the right position.